I love using paper for planning and journaling. There’s just something about putting pen to paper that slows things down, allows me to be mindful, and enjoy the process of planning my day. I’ve tried so many planners, agendas, diaries, note books, and bullet journals. I’m often asked which is best a planner or a bullet journal? So, I thought I’d take some time to discuss the features and benefits of each so you can find out which is the best for you. We’ll take a look at both and talk about the pros and cons of each. I’m guessing you are here because your current organizational system isn’t working for you. In order to be successful, you need to find the RIGHT system to suit your needs at this point in your life. Your goals, schedule, routine are constantly changing, so it is important to evaluate what is working or not working for you. When is it time to reevaluate your organizational system? Do you sit down at your desk and feeling disorganized and unprepared? Do you have to-do lists, paper scraps, and sticky notes scattered everywhere? Do you find it difficult to locate important information? Do you miss important meetings or appointments because you didn’t have it recorded properly? Do you have a hard time keeping track of your family’s schedule? Do you have separate notepads for meetings, school classes, calendars, grocery lists, etc.? If you answered YES to any (or all) of these, it’s probably time to look into a planning system that better suits your needs. Should you go with a traditional planner or a bullet journal? Let’s dive in and talk about the features and benefits of each. Planners come in a wide variety of sizes and with pre-planned layouts. Most often they come out at the beginning of a calendar year and are available in daily, weekly, monthly, or yearly views. They are readily available at office supply stores, stationery stores, books stores, craft chains, and of course, Amazon. It depends on the brand or type you buy that pre-determines what is included. Do you want something small and portable that you can take everywhere you go? Do you do most of your planning at your desk and don’t need to move it around? Do you like to use your planner for appointments only or do you like a lot of space to record lots of details? Answering these questions will help you determine what size planner will work best for you. It’s also important to consider how planners are bound: book bound, spiral bound, ring bound, and disc bound. Each of these systems has their pros and cons. Book bound is beautiful and produces a gorgeous quality book you’ll want to keep for years, but unless it’s a Moleskine, most book bound planners don’t usually lay flat. I always do a “layflat” test before buying a book bound planner. Moleskine was my go-to planner for 4 years. I used the weekly planner. Each spread had a weekly layout on one side and a blank page on the right for notes, tasks, ideas, etc. This was a really great planner for me until I took on more work and needed a larger space to keep it all organized. Below are examples of two weeks in my Moleskine. On the left side of each spread, I write the upcoming events. On the right, my tasks and to-dos. At the end of the week, I decorate the pages and color in all my doodles. Spiral bound is nice and easy to work in, because you have 360 degree turning of the pages. The only downside to spiral bound planners is that they are not customizable. You have to work within the pages provided. Erin Condren creates a well known line of spiral planners. There are quite a few layout options as well as an interesting assortment of fun and colorful covers. Here’s a link to check Erin Condren prices and styles. I also love MomAgenda. This collection of streamlined planners makes it easy to track the busy schedules of your entire family. They have both book bound and spiral bound versions. What I really love about these planners is the clean layout, quality of the paper, the gold edging, and additional pages to track website/passwords, birthdays and anniversaries, and other important information. Ring bound is a style that has been around for ages. Companies like Filofax made them the go-to planner for career-minded professionals. This style is popular because allows you to add or remove pages easily. If you don’t want an entire year in your planner, you can remove all but a few months for a much lighter planner. Many companies that produce ring bound systems also sell lots of additional pages to make it customizable. You can choose daily, weekly, or monthly layouts, address sections, goal setting sections, expense trackers, and plain pages. It’s important to check the ring format because companies make various ring systems. For example, one company may make their 8.5 x 11 planner with 6 rings, while another company makes theirs with 8 rings. Make sure they use the same ring format before choosing inserts from other companies. Disc bound systems are fairly new, but not to be ignored. They are gaining lots of popularity because they are kind of a hybrid of spiral bound and ring bound systems. This system operates on individual discs to bind the pages. The pages are able to be spun 360 degrees around the ring just like on a spiral planner, but you can also add or remove pages just like in a ring bound planner. Disc bound planners come in various sized discs so if you want a thin planner, you select small discs. If you like having the entire year available or lots of additional sections, choose larger discs. One of the most popular examples of a disc planner system is the me & my big ideas Happy Planner. It comes in starter packs and then has lots of additional pages you can buy such as workout, half pages, to do lists, sticky notes, meal planner, notes, and more. Of all of the systems I mentioned, disc bound are the most flexible and customizable. Now that you have an overview of planners, it’s important to think through how you are going to use it. It’s helpful to think through your needs BEFORE buying a planner. Do you like to see the year at-a-glance? Is having a monthly overview important to you? Do you need to see a weekly view so you know what upcoming events are happening? Do you have a lot of daily to-do lists and need room to write things out? Do you have a busy family with lots of extracurricular events that need to be scheduled? Do you work at a job with lots of deadlines you’re responsible for? Do you like setting personal goals and holding yourself accountable for them? Are you a student that needs to keep track of tests and upcoming assignments? Do you need a meal planner and grocery list section? Do you like have a planner that is equal parts planner and memory keeper? Do you want your planner to help motivate you every day? Do you need a planner that keeps you focused on a few important tasks? Make a list of EVERYTHING you want your planner to include as well as how you want to view your calendar. Take it with you when you go to buy a planner so that it fits all of your needs. - No complicated setup. Open it and it's ready to go. - Not always enough space for additional information, notes, trackers, etc. The Bullet Journal is an organizational system created by Ryder Carroll. He was tired of having notes, tasks, and memos floating around making it hard to keep track of things. The theory behind the system is that EVERYTHING goes in one notebook. If you are new to this system, check out my beginner’s guide to bullet journaling. No matter what it is, it all gets recorded in one book. Your schedule, tasks, goals, to-do lists, journaling, meeting notes, gratitude log, project plans, grocery list, books to read, meal plan, mind mapping, weight loss tracker, homework notes, etc. - all of it goes in this book and is readily available. Here’s 101 ideas to put in your bullet journal. Below are some of the things I put in my bullet journal in addition to planning. On the left are some tips for taking better photos as well as how to get rid of a headache (it really works)! On the right are time management tips I got from watching a Brian Tracy video. Carroll’s system uses an index at the front of the book to find important pages that you need to reference later. The pages get filled in as you go throughout your day. You don’t skip pages or create sections because you have the index to find everything. It uses a simple coded system (known as a bullet journal key) to easily identify events, tasks, etc. so you know what you have to do at a glance. It also uses a future log so you can record upcoming events you need to remember. Once a bullet journal is filled up, you start a new one. Some people use one bullet journal a year, while others use five. It all depends on how much you use it and how much information you need to write down. The most popular bullet journal size is an A5 (5.8 x 8.3”) because it’s portable and easy to keep at hand. You can use any notebook, but my favorite is the Leuchtturm Dot Journal. It comes in tons of colors, the paper feels great, and it has a back pocket and ribbon book markers. Carroll has also come out with his own Bullet Journal. I haven’t used it, but it does get really positive feedback on Amazon. He also wrote a Bullet Journal book to take you step-by-step through the bullet journal process. Bullet journals also known as “bujo” for short, have become extremely popular because they are so customizable. If you are looking for a flexible, free form system that keeps track of your entire life, you may want to consider a bullet journal. - Not limited to a predefined space per day - Not always enough space for additional information, notes, trackers, etc. As you can see, both planners and bullet journals are excellent planning systems. It all comes down to choosing the right system for you at this point in your life. I found two really helpful videos discussing the differences between planners and bullet journals. The vloggers have used both planners and bujos so they provide lots of pros and cons of using each. I hope this has helped you consider all of the options you have available when it comes to planning. 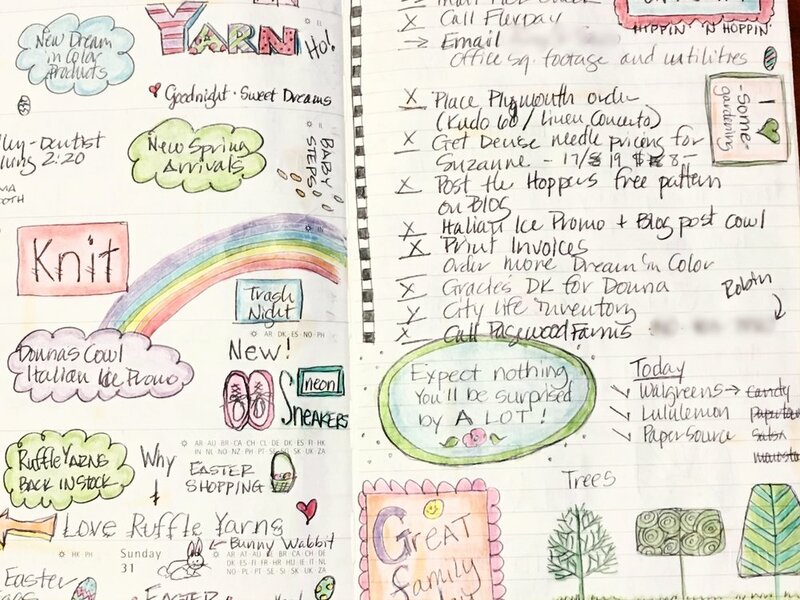 You can read more about planners and bullet journals as well as my favorite tools and accessories on the Resources Page. Are you currently a planner or a bullet journalist? Have you tried both? Let me know what organizer you use and why you love it in the comments below.